Pezhead Monthly: It's certainly awkward to be speaking with a headless Pez dispenser. Can you tell us what life is like for you? Headless Pez: I get that a lot, actually, the thing about how it feels to not have a head. And I won't lie to you, life can be hard at times. You never realize how valuable a head is until it's gone. PM: If you feel up to it, can you describe the day this horrible event happened? HP: I'll give it a shot. I was just standing there with all the other dispensers, when my collector's little brother came up to the display case. He peered over the entire collection, but his eyes finally fixated on me. I don't know why he chose me, maybe it was the way my paint reflected in the light. But he picked me up and started playing with me, pulling my sleeve out of its stem. Well, one thing led to another, and, you know, boys will be boys, and the next thing I knew he snapped my head off with one big yank, and then he began crying quite loudly, because he knew he was in trouble. Obviously, I was in a little bit of trouble myself. Yep, that was a rough day for me. PM: Was there anything that happened that day that gave you joy, despite this tragedy? HP: Well, yes. The boy got a heck of a spanking, and he's not even allowed in the same room as me anymore. Even though I was decapitated, I had to smile. PM: It is certainly important to look on the bright side, especially in such dire circumstances. What would be your chief complaint about not having a head? HP: Oh, that's an easy one. Because I am not blessed with a character head such as Snoopy, Kermit, or Yoda, or any head for that matter, I am doomed to roam the countryside and haunt innocent passersby for all eternity with a pumpkin in my hand. To make matters worse, because I'm just a four-inch piece of plastic, I don't even get the joy of scaring the pants off of anybody. PM: It sounds like you just can't win. It all must be enough to make you lose your head, I'd imagine? 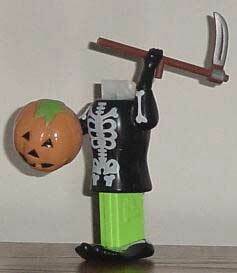 Not having the privelege of a head, the Headless Pez is cursed to haunt innocent passersby for all eternity with pumpkin in hand. HP: I'm not even going to dignify that with a response. "All work and no Pez makes Jack a dull boy. All work and no Pez makes Jack a dull boy. All work and no Pez makes Jack a dull boy."